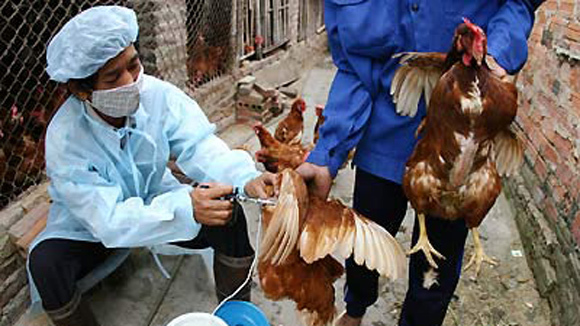 HA NOI (VNS)— A 2014-18 national plan to prevent bird flu has been approved by Deputy Minister of Agriculture and Rural Development Vu Van Tam. The five-year plan is designed to step-by-step curb the spread of bird flu nationwide, is expected to be the foundation to rid the country of the highly pathogenic avian bird flu by 2018, Tam said. The plan, given the thumbs-up last Thursday, calls for reducing the number of bird-flu prone areas nationwide. Under the plan, about 80 per cent of the provinces and cities throughout the country would become areas with a low risk of being struck by the bird flu virus by 2018, while the H5N1 bird flu virus would be completely eliminated in all localities in the south-east region by 2018. According to Tam, the State budget for the plan was estimated to be greater than VND132 billion (US$6.2 million), with local budgets adding about VND583 billion ($27.4 million). The ministry assigned its Department of Animal Health to take responsibility to closely work with localities to carry out the plan, he said. Statistics from the department showed that 14 provinces and cities have reported outbreaks of bird flu so far this year, including Ca Mau, Dong Nai, Hai Duong, Hung Yen, Quang Nam, Khanh Hoa and Soc Trang. The department said that local authorities discovered and took prompt actions to control the outbreaks. A large number of poultry were destroyed after contracting the bird flu virus in the provinces of Khanh Hoa and Tra Vinh, the department said.